My husband recently started working from home and decided he wanted a standing desk. 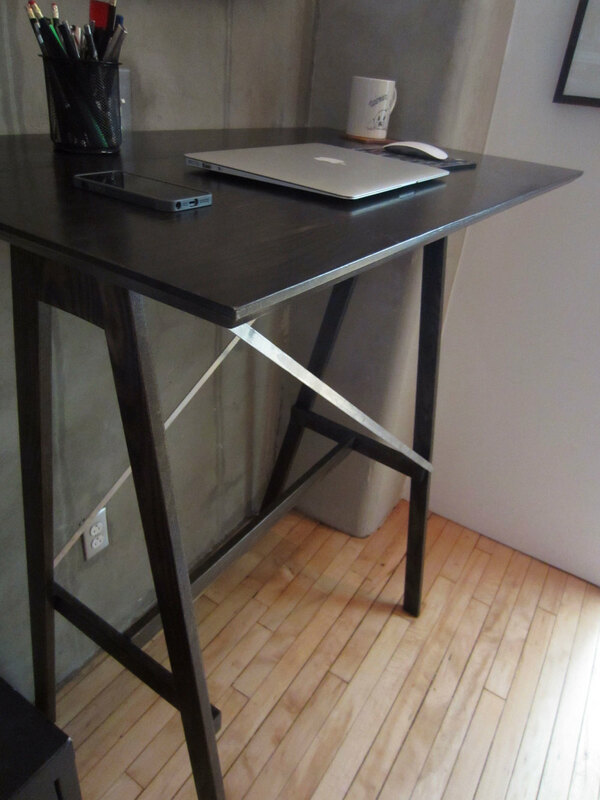 What is a standing desk, you ask? Well, it's pretty self explanatory. Perhaps the better question is: WHY would anyone want a standing desk? I mean, I am lying on my chaise right now eating some cottage cheese as I type this. Why would anyone want to stand? 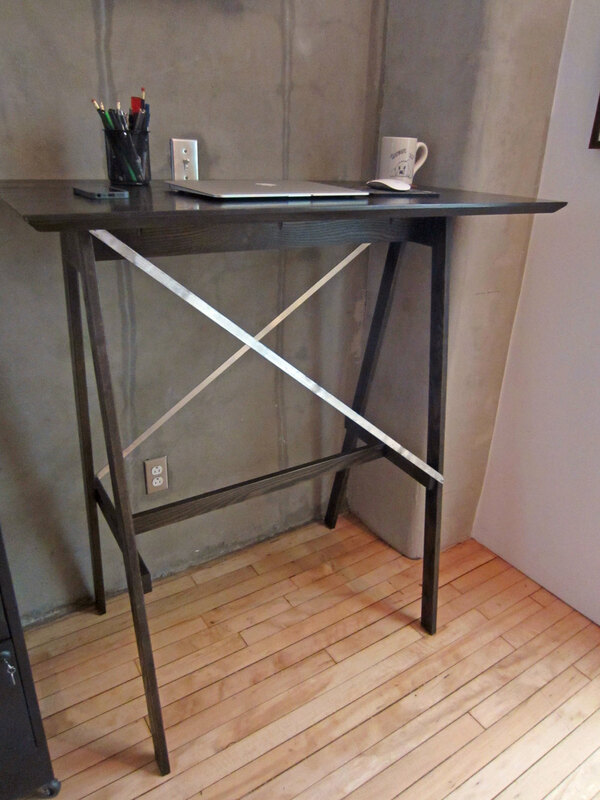 Standing desks have come into favor recently, as studies have shown that too much sitting down may shorten your life. Standing desks are not new; Ben Franklin, DaVinci, Churchill, Virginia Woolf and Ernest Hemingway are all said to have favored the standing desk. For Adrian, it was simple. He wanted the choice to sit or stand in front of his computer while he worked. As we searched for an adjustable standing desk, we found ourselves in a similar situation as when we were searching for modern furniture to hide the litter box; either things were beautiful and too pricey or more affordable, but ugly. I searched for some DIY solutions, but again, all unsightly. If Adrian's office is in our home, I want it to look good, not like I threw a shelf on top of some random IKEA desk. (No offense to those that did that, its just not for me.) And since I have the know how and access to a wood shop, I decided to go ahead and design and build my own. So I got some ash from Bohnhoff and went to work! I basically followed the measurements of the Stash desk, except made it taller. Then I took it home and did a dry fit to make sure the desk was at the right height. I made Adrian use it like that for a week to make sure. He fell in love with it and was mad when I took it away from it to stain and poly it. I also added some aluminum across the desk to give it a bit more stability. If I were to build another one of these, I would make the legs and the cross bar thicker. The way the desk looks from the front reminded me of the Hancock Building in Chicago. I used Zar oil based stain in Onyx and Zar Ultra Max Poly for the finish. I liked the stain but did not like the poly at all. I applied it with a foam brush and saw a lot of marks. I will go back to the Minwax Oil-Modified poly (what I recently used on the headboard I made). It's way easier to work with, IMO.